The City of Toronto, the Toronto Transit Commission (TTC) and Metrolinx are working together to bring more transit to communities across the city with connections to the entire Greater Toronto and Hamilton Area (GTHA). There are a number of transit expansion projects underway, each in different phases of planning, approval, design and construction. Collectively, these projects are building on Toronto and the region’s rapid transit network. City staff anticipate a comprehensive report to City Council in early 2019 on Toronto’s transit expansion program, including the identification of transit network priority projects to be submitted for federal infrastructure funding. Transit network expansion is a key component of the City’s broader transportation system improvement plans. Access to rapid transit is critical to achieving Toronto’s social inclusion and economic development objectives. Approximately 37 percent of Toronto residents rely on transit infrastructure to make important connections to employment, school and community and social services. To support both existing and anticipated growth of the City over the coming decades, the City of Toronto, TTC and Metrolinx are working together to plan and deliver a multibillion-dollar transit expansion program. Several large-scale investments have recently been made to expand Toronto’s rapid transit network, including the Province of Ontario’s Toronto Light Rail Transit (LRT) Program (2012), GO Expansion (2014), the opening of the Toronto-York Spadina Subway Extension (2017), and the City of Toronto’s SmartTrack Stations Program (2018). In March 2016, City Council adopted the report Developing Toronto’s Transit Network Plan: Phase 1 (EX13.3), which presented a comprehensive 2031 transit network plan based on the City’s Rapid Transit Evaluation Framework’s (RTEF) three city-building objectives of serving people, strengthening places, and supporting prosperity. Since then, City Council has considered a series of reports that have advanced planning and design of Toronto’s transit network. Key reports and actions, as well as the current status of each project, can be found on the linked project websites below. In 2017, the TTC moved 533 million riders, and today it continues to be the largest transit agency in Canada, serving roughly 85 percent of all local transit trips in the GTHA (TTC Operating Statistics, 2017). The TTC is essential to moving the GTHA as a whole, given the number of GO trips that include transfers with the TTC. Demand on the TTC network will continue to increase given anticipated growth in the City and region over the coming decades, particularly in Toronto’s downtown core. To meet growing demand and improve connectivity work is underway to integrate local and regional services to ensure seamless travel across the city and the GTHA. These initiatives include the GO Expansion Program, the SmartTrack Stations Program, the GO-TTC Discounted Double Fare Initiative, and work on fare integration. The City and TTC also continue to work closely with Metrolinx to implement the 2041 Regional Transportation Plan (RTP) for the GTHA, which was adopted by the Metrolinx Board in March 2018. The 2041 RTP guides transformation of the regional transportation system in the GTHA that will provide more people with access to fast, frequent, and reliable transit and transportation options. 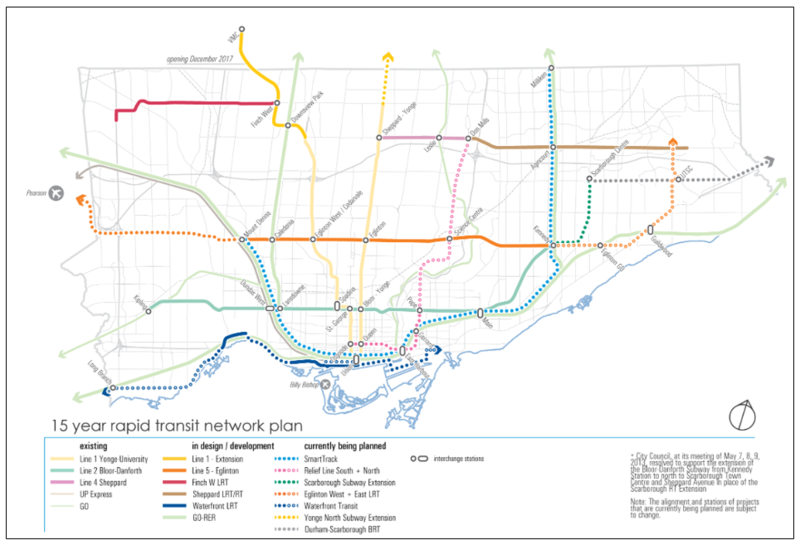 The RTP prioritizes the completion of many transit network expansion projects in Toronto. Implementing the 2041 RTP is a shared responsibility that requires the participation of all municipal partners. April 2018 City Council approved a contribution of up to $1.463 billion to the SmartTrack Stations Program subject to the terms and conditions described in Attachment 1 of report EX33.1. November 2017 The City and TTC entered into a Discounted Double Fare Initiative with Metrolinx and the Province of Ontario, representing the first step towards broader regional fare integration. May 2017 City Council directed staff to undertake preliminary design and engineering to develop a baseline project budget and schedule for the Relief Line South and Yonge Subway Extension. Council also reaffirmed the Relief Line South and Yonge/Bloor station enhancements as a priority transit projects. December 2016 City Council confirmed its key priorities for Phase 2 Federal Infrastructure Funding, including a number of transit projects under the Public Transit stream. November 2016 The Province of Ontario and the City entered into an Agreement in Principle that established terms and conditions with respect to the funding and construction on the SmartTrack Stations Program and other transit expansion initiatives. March 2016 City staff introduced a vision for Toronto’s Transit Network and Council adopted several recommendations that provided staff with direction to review and refine individual projects within the network plan. July 2013 City Council confirmed its support for the Scarborough Subway Extension subject to confirmation of federal and provincial contributions and authorized the City Manager to amend the Toronto-Ontario LRT Master agreement to the Scarborough Subway. November 2012 In November 2012, Metrolinx, the City of Toronto and TTC signed a master agreement for the implementation of the Province of Ontario’s $8.4 billion Toronto Light Rail Transit Program (Eglinton Crosstown LRT, Finch West LRT, and the Sheppard LRT).